Hello to all of you coffee-loving crafters! 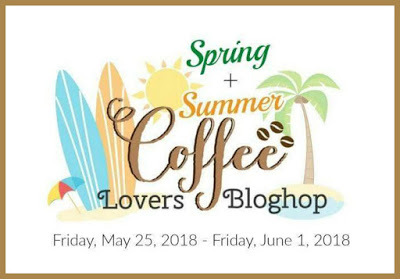 I hope you've all been enjoying the Spring/Summer Coffee Loving Card Makers Blog Hop. Holy cow...have you seen all the amazing sponsors? What an amazing crafting community we have. So many generous companies and just really some amazing talented people. I've sure enjoyed visiting all those who have entered, seeing their amazing projects, and commenting on each one. I even figured out the glitch with Splitcoast Stampers. It's been SO much fun! This little card was created using some patterned papers by American Crafts. I placed them onto a kraft card and ran a length of yellow seam binding that's tied in a bow and topped with a blue sweetheart blossom. The sentiment is from Stamp Simply Clear Stamps, and the coffee cup is from Paper Sweeties. It's pretty simple, but I like how it turned out. Thanks so much for stopping by and for your comment. Have a great week and be sure to stop by and play along. Simon Says Stamp Wednesday Challenge - Use More Than One Stamp - I used Paper Sweeties coffee cup and Stamp Simply sentiments. 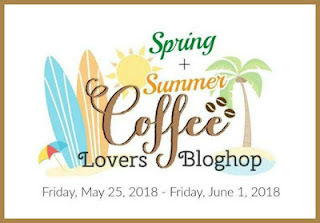 Coffee Loving Cardmakers Spring/Summer Blog Hop - Anything Spring/Summer and coffee or tea related. Love the combo of papers with a sweet cup! 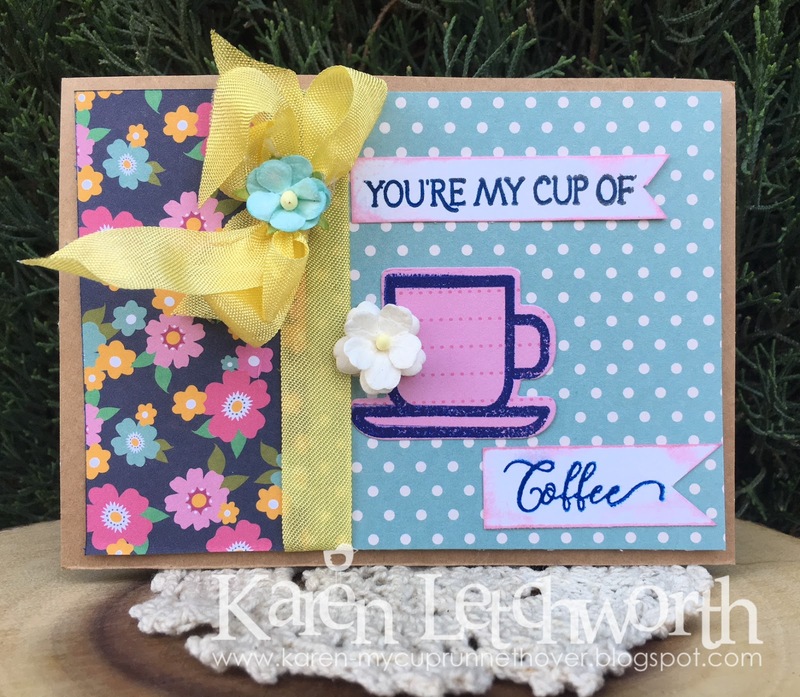 Another fabulous coffee themed card! Love the sunny colours and the sweetness! What a sweetie Karen - love this simple wee card, it's so pretty in it's home spun simplicity. Very pretty card. I love the two papers and your ribbon. Sweet card. Such a sweet card, Karen! And I love that sentiment - I've always heard "you're my cup of tea," but this one is even better! Must remember this! P.S. You asked on my blog where I'm from - I live in Nova Scotia, Canada. Have a blessed day! Karen, Love how the 3-d flowers look with your dp flowers. So pretty. What a fun combo of papers for this sweet coffee card! Pretty!!!! My card (from your comment on Flickr) uses a stamp from Unity Co (On the Go is the name of the series). Karen, you've been a busy bee! This is a beauty...I always love seeing you use ribbon! So pretty! Love how that ribbon pops with the other colors! So well designed and gorgeous. Wonderful papers, flowers and colors. Such a sweet card, Karen! So Pretty Karen! Lovely card! This is so pretty Karen~love that bow! Sweet card! I love the mix of papers on kraft! Beautiful use of papers! Love the colors!!! Cute--I like the polka dot and floral papers together. What a beautiful coffee card. I love those patterned papers and color combo. You’re an inspiration, my friend!